Many people who are interested in creating a Blog but are confused about where to start and what to do. The basics needed to build a blog, so that no difficulty in managing or creating content. For beginners, you can try to find information about the initial steps to create a blog. Next, Next Siooon (NS) will share tips on starting a Blog for beginners, hopefully with this you will not be confused in creating a Blog. Choose a lightweight and easy-to-use template besides the Edit Widget on the Blog to beautify the appearance of the Blog. This is very important because it makes visitors feel at home on your blog for a long time, note also the size of letters, colors, fonts, make sure they can be read properly. Avoid using complicated colors and fonts. There are many blog templates that are SEO with an attractive appearance. There is a name and domain on the Blog, if the name is a name like the Butterfly Blog or the TechO Blog is different from the domain example such as: www.butterfly.blogspot.com or www.techO.com make sure to choose the same name and domain. Making it easier for visitors to remember your blog. Besides that, it's useful to make it easier for Search Engines to index your Blog. In this world there are lots of blogs with various content and different content, but the same goal is to get a lot of visitors. One of the successes of blogging is having many visitors and becoming a popular blog. Determine the characteristics of your blog such as language, writing, images, or videos so that your blog has a different characteristic from other blogs. You may imitate other sites only as references rather than duplicate content. Because other than that it violates also gives a bad impact on the Blog, because it will be detected in Search Engin as the result of imitating content from other sites. Make sure you make your original article, this will make your Blog detected on Search Engines. Thus it will bring many visitors and can be a reference for others. Duplicate content will also reduce the quality of the blog, especially for readers who prioritize Copyright. Besides this it will be dangerous for your blog because it is considered to have no quality. Next is you have to be diligent and enthusiastic about making articles and content so that Blogs look fresh and active because there is new information. The more content on the blog, the more opportunities to get new visitors. Blogs with articles that look a lot more professional, it's no wonder many blogs have articles reaching hundreds or even thousands. You can try by making art 2-5 a day, you should not make articles in large quantities in a short time. Because it will be considered SPAM, it's a little better but has high quality. After having a blog and some content, you can share your blog. The first step can be shared with friends to visit or can share to social media. There are many ways to promote a Blog, but what is easier is by registering for a Search Engine, by appearing on a Search Engine, you will have a higher chance of getting visitors. 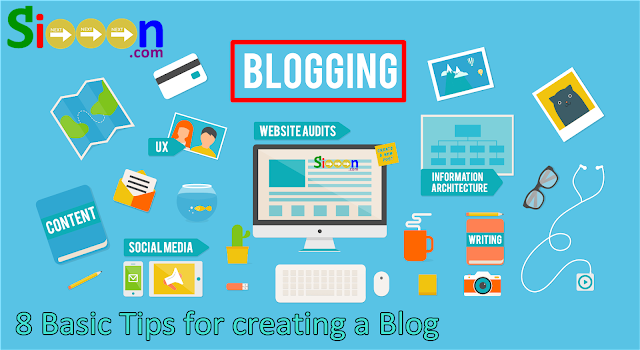 That's the 8 basic tips for beginners who want to create a blog according to Siooon Next (NS), with these tips hopefully it can make it easier for those of you who want to create a Blog. Keyword: Creating a Blog, Basic Creating a Blog, Starting Tips for Creating a Blog, Getting Started with a Blog, Getting Started Creating a Blog, Basic Tips on Creating a Blog for Beginners, Tips for Beginners to Create a Blog, 8 Important Things when Creating a Blog.